Tarot nodded slowly, as if making sure she knew he understood. He offered a small smile in reply. "It's clear, Indira. Crystal clear." The black haired were wolf laughed lightheartedly and turned to the door that lead to the bedroom. His exhaustion clung to him like a burr, and his sluggishness made him choose to rest before going up to the attic. Without yawning, and instead rubbing his head, he climbed up the stairs. Not at a speeding pace, but enough to cover up most of his grogginess. He stared at the doorknob for a minute. Then gently turned it and push in the wooden door. It creaked open, making him cringe at the ear slitting scream that rang off the metal hinges. He groaned and rubbed the side of his head and entered the room. His brown eyes darted around, bouncing off it's interior furniture. It was a good sized bedroom, maybe on the smaller side. A twin sized bed stood in the corner, and a small nightstand next to it. A white curtain billowed from the window as the wind blew in a cool breeze. A small closet sat aside from everything else. Tarot stared at the bed longingly, but slipped off his shoes first. The feel of wood stretched under his feet. He rose his arms to the ceiling and shut the door, trying to close off the shriek that rose from it's hinges. He rubbed his eyes and fell on the bed. His eyes staring up at the ceiling. With a loud yawn, tears sprung from his eyes. He then bundled himself up under the covers and relaxed. More than he usually did. Medicine always made him drowsy. Indira gave him a sarcastic salute as Tarot walked up the stairs to the guest room. She then wandered over to the glass window opposite the carved desk. Peering outside, Indira saw that the moon had somehow silently crept into the middle of the starry sky whilst she had been conversing with Tarot. Sudden exhaustion hit her like a stack of bricks when she realized that she had been awake for over 2 days without even a wink of sleep. She crept up the stairs after Tarot except Indira turned into her room. Already asleep, she collapsed on the bed and lay there without even getting under the covers. Tarot felt his chest slowly rise and fall. After he had gotten his fill of sleep, he had just kept lounging in the bed. He blinked open his wide awake brown eyes after he started getting bored. The pain still dulled his senses and energy. 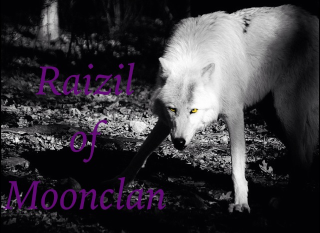 He peered down at his hands and sighed as instead they came up as raven colored paws. He sat up and realized he was on the floor as well. The black wolf glanced at his back and stared at the limp tail at his side. With an exasperated sigh, he stood up on his four feet and shook out his black pelt. His ears angled around the room, listening to the bugs crawling in the walls, and his night vision was enhanced, spotting the tiny notches in the wood walls of his room. 'The human form always hinders everything.' Tarot thought with a quiet snort. His nose crinkled as the herb scent had grown scent ever since that earlier afternoon. He cleared his throat to keep from gagging again. Rubbing his jet black nose with his forepaw he peered out of the window. His brown eyes narrowed to small slits. 'Night came a lot faster than I thought it would...' Tarot had a tired look on his face as he turned to stare at the wooden door that kept him in the room. He shrugged and waved his tail in the air behind him. 'At least Indira didn't see me-' The male froze as the scent of werewolf blood wafted over him. Turning on his heel towards the door way, his hackles rose. He kept the growl inside his throat. He wanted to keep the element of surprise he had in this encounter. His tail low, and his ears shoved forward as he shifted back to his original form. The fur seemed to wrap into itself to reveal a taller human form. Tarot scrambled to pull his pants on. The were wolf scent came from Indira's room, and he was worried about her. He didn't even take the time to button up his shirt all the way. His footsteps echoed in the house, but he managed to keep them to a low whisper. When he got to her door, he felt himself tense. He couldn't sense a presence other than Indira's. The door was let ajar. His intelligent brown eyes peered through the small crack. She was sleeping soundly, still in her clothes, and on top of the covers. 'I'm not that much work! But she seemed exhausted. No wonder someone could sneak in here.' He didn't notice any fur or any other signs another were wolf had been in the room. A few tufts of blonde-brown and tan hair and fur were scattered around the room, but Tarot knew they were Indira's. 'Wait...' Realization dawned on his face. "You're...You have got to be kidding me..." He muttered under his breath. The half-dressed were wolf edged the door open. He leaned on the wall and stared at her chest which slowly rose and fell with each deep and steady breath. "I need to take better care in studying my surroundings. How did I not notice until now...?" He whispered, crossing his arms. A frown twisted into his face as he contemplated his thoughts in the dark and silent room. The only sounds were Indira's deep breaths and the curtains in his window billowing in the breeze. Their flapping sound made him feel uneasy. They were unnecessarily loud, but Tarot didn't feel like closing the window. If Indira could sense Tarot's sudden presence in her room, she didn't wake up. The dream she was having was too vibrant and detailed to be a figment of imagination, no it was a memory. The sky was pure black, no stars or moon to be seen. The forest seemed hostile and cruel, the trees stretching up to the sky like shadows. The river beside her rippled softly but it had the same piercing image of shattered glass. She was in wolf form, her small sandy-blonde form laying still on the damp green grass. Blood was rising up from a bad wound in her chest that would later leave an almost star-like scar. The scent was metallic and made her mouth water even though it was her own. A very large grey scarred wolf was crouched over her still form, it's jaws gaped apart menacingly as it leaned closer to take a bite if her flesh. Quick as a viper, Indira twisted her head around and sunk her own fangs deep into her parent's murderer's throat with a sickening crunch. Indira's eyes flew open at that point. She was quite cold. Still clutching her pillow, she walked over to the open window and slowly shut it with a creak. Turning around, she went to go back to bed when she spotted Tarot lurking in her doorway. Tossing the pillow she was holding, she growled at him. "Holy Christ! Do you always watch people when they sleep? And put some damn clothes on!" Tarot had escaped reality and slipped into his own thoughts, so when Indira woke up he didn't notice. He tapped his chin absentmindedly, when a pillow hit him square in the face. He fell back onto the wall with a,"Gah!" A loud thump sounded through the walls. That loud thump was Tarot's head. He rubbed it gently and glared at her. "I am not a creep! I don't watch people when they sleep!" He snarled back. It was true he was watching her, but he had just been suspicious of the werewolf blood scent. Not that he remembered about the scent now. Tarot also realized that he was only half dressed. He snickered and crossed his arms. His left arm was still throbbing, but the pain didn't bother him as much. 'She really is good at this healing thing. It's almost as good as new.' But the werewolf pressed on with his teasing. "Am I that distracting?" He asked in a mischievous tone. A smirk wound it's way onto his face. He was still wearing his earlier clothes, only that his shirt was unbuttoned. His bare feet shifted in the wood floor as he leaned onto the wall. "Obviously you were watching me and, unlike most girls, I do not appreciate a half-naked man wandering about my house at ungodly hours of the night!" She snapped back, hurriedly reeling back her wolf before it snarled at him. Not being hostile of course, just a little bit startled as any normal human or werewolf would be if they were awakened by a dude just standing in the middle of their bedroom doorway like a gargoyle. Indira had never met a boy her age when she was younger so seeing a man's anatomy, even if it was just his torso, was a little bit out of her normal comfort zone. Even if her comfort zone consisted of herbs, healing and hunting. "Don't laugh! It's not funny!" Indira muttered, frowning in embarrassment and frustration. Glaring at Tarot as she watched him slide down her bedroom wall as he became teary-eyed from his outrageous laughter. It can't of been that amusing. But then Indira remembered her short size and she guessed that to Tarot she resembled a tiny growling dog or puppy. The thought made her frustration grow more but she knew that even if she did shift, he would probably laugh at her wolf's small form as well. Anyway why was he watching her sleep in the first place? Indira couldn't smell any danger but there must have been a reason. "Why were you creeping by my door in the first place?" Indira asked him, barely keeping the malevolent tone out of her voice. Tarot lifted his head and stared at the ceiling. His eyes crinkled in thought. "I..." The black haired boy sighed and scratched his head as he turned to Indira. "I..." He remembered the reason, but he that that he would seem pretty stupid for not knowing that Indira was a werewolf. He frowned as he finally spoke. "I smelled were wolf in your room." Tarot stood up with a small grunt of effort. He yawned and stretched his arms to the ceiling. "All your herbs made it hard to distinguish other scents, so I assumed it was an intruder." His brown eyes blinked the tears away from his yawn. "I wasn't going to pounce on you in bed. I'm not that desperate, so calm down." He knew her embarrassment was more directed to him laughing at her, and it was funny. Seeing her small body yelling out in anger was just too entertaining to miss. But he decided it wouldn't hurt to just tease her more. Indira frowned at the insult, her hands tightening into little fists by her sides with the wooden floor seeming ice-cold compared to the boiling rage that was writhing inside her chest like an angry viper. The werewolf comment didn't bother her, Tarot should've figured it out in the first place and there was a tiny pin-prick inside her that was glad he hadn't ripped her throat out. But that still didn't excuse the bothersome male from his insults. "Glad you didn't. You would have probably given me a disease with all the infections you have been getting!" Indira muttered loudly, casting a sly glance to the wound of his arm. It was clearing up well, thanks to her, but the poison might still be in his blood stream. Tarot raised an eyebrow. He had just met the girl earlier that night, he shouldn't have tried to approach her like his best friend he hadn't seen for a few weeks. He clenched his jaw and glanced to the side as she lashed out with some more of her viperous words. "That's true." Then he snapped his fingers and turned to her as she stared at his arm. His brown eyes widened again. "But you're really good at this. I mean I'm feeling better already." It was a long shot, but at least the grateful words would carefully nudge her back to herself. The waves of pain were still there of course, but they were at least bearable. The black haired brute sighed and scratched the back of his head. Standing up, he rubbed his eyes again. "Sorry for disturbing you while you were sleeping." But Tarot paused for a second. Even if he was lost in his thoughts at the time, he had faintly remembered her waking up to close the window on her own. 'Did she have a bad dream or something? Or did she need to go to the bathroom? Was I too loud? No I doubt that, I've been swooping around places for years...' That thought jolted him back to reality. His brown eyes hardened a little. "G'night." He waved to her. A hard ball of shame sat in his stomach. Both from Indira's encounter and another encounter of his own. He turned on his heel to head back to his room. Hands in his pockets. He yawned to cover up the unshed tears in his eyes. Not that anyone could really see them in the dark. Indira gritted her jaw in thought as Tarot proceeded to leave her room. Her retort had been a little bit harsh, okay a lot harsh, and Tarot was just teasing her. He hadn't done anything wrong, Indira had just been a bit startled. "Ugh.." She sighed, burying her head in her hands. Why was she so hot-headed? Then, making up her mind, Indira removed her hands from her face and paced after Tarot. Reaching him as he reached his door, she leaned up on tippy-toes to place a small hand on his shoulder. "Sorry for what I said." She murmured before quickly turning around and pacing back to her room. Indira flung herself onto her bed as she tried to fall asleep for the third time that day. Tarot turned around to look at Indira with surprise, but the girl had already disappeared all on her own. He blinked his brown eyes in the looming darkness. After standing in silence for a few minutes, he cracked open his door and sat down on his bed. With a yawn he fell back on his back. His eyes stared at the ceiling absentmindedly. He wasn't tired anymore. Actually he was bored. He clasped his hands behind his head and finally decided to venture into town. At least he would have something to do. Sitting up in bed, he scoured the bedroom for a piece of paper and something to write with. He ended up with a tiny stub of charcoal and a discarded piece of newspaper. He scrawled a few words on it, explains he went into town to get a better feel for his surroundings. Even though he was actually going only for the fun of it. Then he wrote a little note saying his arm was fine and didn't hurt much any more. Tarot stood up, making sure his arm was bandaged tightly then shoved his arms in his pockets to walk out of the apothecary and into the night. Blake peered into the apothecary. The wooden walls seemed a bit foreboding in the dark, but the girl paid them no mind. Instead, she was more curious why the door was slightly ajar. She stared at the mangled knob and frowned. 'Indira knows better than this right? She may very well be the hermit that lives in the woods, but at least she knows there are wild animals out there...' And something always smelled musky in the house. Blake always assumed it was mildew or something of the sort, but it was stronger now. Like there were two different specimens of mold now. The vampire crossed her arms with an exasperated sigh. "I come to get something for father, and I end up having to take care of someone's mold and door problems...' She muttered with irritation. Blake pushed open the door as quietly as she could, knowing very well that Indira may have had a long day. The brown blonde got cranky if she didn't get enough sleep. She cringed when the slightly rusted hinges screeched midway. She continued pushing it with a more careful hand. The girl stepped into the house and stared at the high ceiling. She studied the walls for any sign of Indira, but noticed none, other than the herbs that rustled in the wind brough through the door. Blake glanced around one more time, before sitting down on a wooden chair. She crossed her arms and leaned back. 'I'll just have to wait. Dad really needs that concoction soon. His beloved hammer started rusting and he practically panics like it's the apocalypse...' Blake clicked his tongue with annoyance and continued in her mind. 'He practically kicked me out of the house to get me here.' The black haired vampire closed her eyes and tried to catch some sleep before going up the stairs to wake up Indira. Indira wriggled her blonde-furred form over the covers, wriggling her paws and tail as she fought the morning laziness again. Sitting up on her hindquarters, she yawned loudly displaying all of her large fangs. Indira could smell Blake downstairs so she hurriedly shifted into her short human form and dressed into some clothes that weren't shredded. Those ripped she merely discarded on the floor of her bedroom. Running down the stairs, Indira frowned as she saw Blake sleeping on one of the chairs. So she walked over and gently tapped her several times on the head. "Oi, wake up!" Indira grumbled at her friend. Blake felt her body freeze and tense when something poked her forehead. She cracked open her sleep crusted eyes and moved her arms above her head to stretch. With a yawn, she rubbed her eyes and turned to Indira. The girl still hadn't grown since she had last seen her. 'Does shortness run in the family?' Blake used to know her aunt, and she was fairly small, even before she got to an older age, but she kept the thoughts to herself and masked her face to keep from offending her friend. Her bloody eyes darted over to the door and some pale orange light shined through. 'I slept through the night...?' She thought with an inward groan. The black haired girl stayed in her seat, and gave a small smile to Indira. "Sorry for disturbing you, but can I get that rusting tonic stuff you make?" She paused, hesitating to tell her the whole story and somewhat wasting her time. Indira sighed heavily. "I'm a healer not a carpenter or blacksmith or what ever. But fine." She muttered, making her way to the tall dusty shelves. Pulling out a small step ladder to reach the 3rd shelf (god she's short), Indira began to rummaged through the herbs before abruptly stopping. She dipped her head to the floor and groaned loudly in frustration. Daylight frazzled his brain, so at one point Tarot wound up back at the apothecary. His dark eyes crinkled with grogginess. Yes he was used to going out on midnight exclusions, but the wound was a burden to his body. He dragged himself into the house and was about to call out to Indira that he was back, but he froze when he spotted the two girls in the house. The black haired brute opened his mouth slightly, and the tang of vampire wafted over him. He kept his attention on the girl, but spoke to the healer. "Indira...?" He said, his voice uneasy. 'Wait wrapped arm...?' She stared absently at the dangling hand, and after a few minutes realized she was staring. Coming back to her senses, she switched glances between the two. She finally came to a stop at the man again, and rubbed her arms. "So...did you like...Break your arm or something?" She asked in a quiet, slightly shameful, tone. 'Why do I have if just to conclusions so quickly...?' Blake felt like hiding in a hole. Indira murmured to herself as she continued rooting around her shelves. "Blake, this is Tarot. Tarot, this is Blake." She introduced each other over her shoulder, her green gaze still fixed on finding some cotaln for the rust. If she had ran out then Indira would have to go to the vampires territory, which was a last priority since a very ominous aura had started to leak out from the roots and foliage on their side. Indira drummed her fingers on the side of the wooden cupboard as she continued to search for the herb, ignoring the tension between the other werewolf and her vampiric friend. The black haired brute glanced sideways at the half brown and blonde girl. With a frown, he turned back to the girl named Blake. She seemed really suspicious of him, and he was too, but he could just feel the waves of hostility coming off of her. He blinked with surprise when she asked him for his business, but quickly narrowed his eyes in irritation. 'She isn't very observant is she...?' With an exasperated sigh, he replied in a casual tone. "Name's Tarot. Like,"he nodded towards Indira. "What she said. My business..." The girl interrupted him, asking what happened to his arm. He clicked his tongue and scratched his head. "Tck! Finally noticed? I got stabbed with some kind of poison." He said walking into the house nonchalantly. "Indira here helped me out. I'm only staying at the apothecary for a few days until it's completely healed." He came to a stop in front of the black haired girl. "If you have something to say to me, say it. I'll answer all the questions you have." He said with another tired sigh. Blake grunted in surprise when he admitted to staying with Indira. She whirled her head around to the blonde-brown haired girl with a gaping mouth. She was speechless. 'Does she even have any sense?!' But her attention was drawn back to the male when he spoke. Her bloody colored eyes narrowed with suspicion. The musky scent was all over him and Indira. She stifled a recoil of disgust. 'Do they even wash themselves?' The black haired girl clenched her fists and replied hotly. "Why don't you stay at a nearby lodge instead of here?" Her face was tinged with resentment towards the brute. She didn't feel comfortable with the fact that her friend was living with a guy under one roof. *Damn it. * Indira thought as she found the pot of the herbal remedy. It was empty, apart from a dry smear near the glass rim. She looked over at the two taller people. The silence between them was awkward, like a silent stare down or like you've witnessed a man's marriage proposal be refused. Indira made a sharp whistling noice that hurt her own ears. "Oi! I've run out of the remedy and the place I need to get it from... doesn't seem very friendly at the moment." There was no way that the small blonde could explain to the 'innocent' vampire about the wolves, the vampires, the moon. Half of the stuff Indira didn't even understand herself. The two girls seemed to dislike his presence more and more by each passing second. The one named Blake did not approve of his mere existence in the apothecary. Indira, well, she hated him from the beginning. He sighed in exasperation and replied in an unpolite, curt way. "I don't have any money." He continued without missing a beat. "I'm just helping the poor girl our, ok?! You blasted villagers are so oblivious!" He grumbled, with an irritated snort. The vampire didn't seem to believe him, it was written all over her face. A sharp whistle made him recoil and plant his hands on his ears. He could still hear Indira as she spoke, but it was muffled. "Ok, ok, you've got my attention." He said uncovering his ears. The ringing in his head didn't disappear until he paused for a few seconds. "You didn't need to go as far to break my ears." He muttered, rubbing the structures on the side of his head, but what caught his attention was her hesitation. "It doesn't seem friendly? When was anything friendly around here?" He mumbled just about his breath.